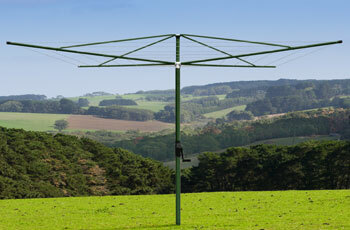 Austral still manufactures a range of Fixed Rotary clothes lines. Whether for commercial or residential use, the Fixed Rotary offers the strength and reliability associated with washing lines of yesteryear. Austral also offers a Powdercoated Galvanized Rotary. The Elite is a 4m Deluxe Rotary powdercoated in Heritage Green. The Elite has all the traditional features of a galvanized rotary with a one piece Helical Column and plastic gear case. The Super Rotary Hoist is built to last with Galvabond tubing, Galvanized wire and a Metal Gear Case. The Deluxe Rotary Hoist uses the same Galvabond tubing and Galvanized wire as the Super Rotary Hoist but features a one piece Helical Column with plastic gear case. Austral’s Super Rotary Hoists are available in 3 sizes. The Deluxe Rotary Hoists are available in 2 sizes. 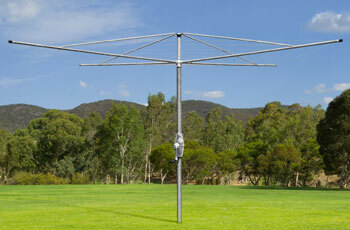 The Elite is a Powdercoated Deluxe Rotary clothes line. The Austral Rotaries are manufactured using sturdy Galvabond Steel and Galvanized wire to ensure strength and durability. Ideal for virtually maintenance free situations.